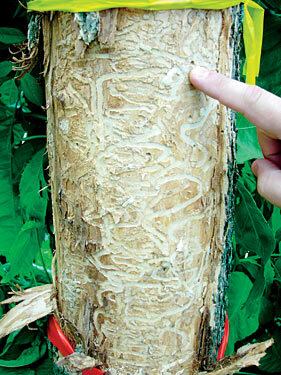 The exotic emerald ash borer (EAB) has been killing ash trees across North America. Native to China, eastern Russia, Japan, and Korea, it was first discovered near Detroit in 2002 and has since spread to 25 states, including New Jersey. This metallic green insect infests and kills ash trees—all ash species are susceptible, with the exception of mountain ash. EAB larvae feed on the inner bark and disrupt the movement of water and nutrients, essentially girdling the tree. This insect often infests the upper branches of the tree first and may affect branches as small as 1″ in diameter. It takes 2-4 years for infested trees to die, but mortality is imminent. Since its discovery in North America, EAB has spread rapidly. It occurs in 25 states and 2 Canadian provinces. It was first discovered in NJ in 2014. The greatest impact will be for community trees and privately owned trees. The beetles are strong fliers, and good at finding ash trees. When the beetle first arrived in Maryland, the infested area expanded about ½ mile per year. Often people unintentionally spread this insect when they move firewood from an infested area to a new location. Beetles and larvae also hitchhike to a new area in nursery trees and saw logs. EAB is in New Jersey. Plan for EAB now if you have ash. Know what’s at risk: how much ash you have, its size and quality, and where it’s located. Consider the ecological, aesthetic, and economic value of your ash, your tolerance of risk, and your objectives for ownership. If your land is enrolled in Farmland Assessment or the Forest Stewardship Programs, you must follow your approved forest management plan or an approved amendment. Contact your consulting forester if you wish to change your planned activities, treatment schedule, or management objectives. Remember that the state forester needs to approve any changes before the management activity begins. With an approved forest management plan that addresses EAB, you can salvage and restore ash in riparian areas when they follow the prescribed Best Management Practices. Reassess your plan if EAB is detected in or near your county. To date, EAB has been found in Somerset, Mercer and Burlington Counties. The threat of imminent tree mortality increases when EAB is within 10 miles of your property. Work with a consulting forester or Certified Tree Expert to get the most from your forest. Studies have shown that owners who use professional forestry services before they cut make more money and are more satisfied with the results than owners who sell timber on their own. Identify ash trees. Ash species have opposite branches and leaves and a compound leaf with 5-11 leaflets. The bark has a unique diamond-shaped ridge bark on older trees, but younger trees may have smoother bark. Monitor your ash trees for EAB, you will know when the risk of mortality becomes urgent. Look for the dying branches at the top of the tree, woodpecker damage, galleries under the bark, D-shaped holes, green adult beetle, and sprouting. Spread the message, Don’t Move Firewood.” Visitors who bring infested firewood to second homes or campgrounds near you put your trees at risk. Talk with neighbors and campground owners in your community. Report EAB sightings to the NJ Department of Agriculture. 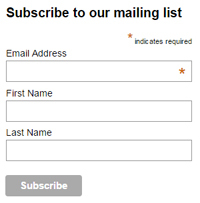 Collect and/or photograph any suspect insects and larvae. Note that several insects look similar to the EAB. Click here for our summary printable flyer.